Evolve Big Alpha Weekend - Win a Key! Evolve Big Alpha Weekend – Win a Key! Have you been trying to get into the Evolve Big Alpha? It’s already won a bunch of awards this year and it’s not even going to be released until February next year so the excitement is building already. This weekend, starting on Friday at 9am PDT (4pm UK, noon EST) , they are opening the gates to Big Alpha participants to play and test the content that is ready now. Anyone who preordered Evolve before 21st October were guaranteed a key but the rest of us just had to sign up for giveaways across the internet and keep our fingers crossed. 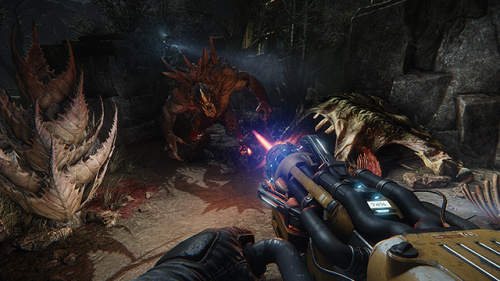 If you haven’t heard about Evolve yet, it’s a first person multiplayer shooter game with a big difference. You can play as the monster (solo) or as part of a hunting team (four players) and the idea is for the monster to evade the hunters for as long as possible while he grows and evolves. Once he is big and strong enough, the tables are turned and the monster gets to hunt the hunters down. The hunter team has different roles, assault, medic, support or trapper which means there is a play style for everyone. The good news is that we have 3 keys to giveaway for the PC version! All you have to do is sign up to the mailing list over there on the right hand side of the blog and then check your email after 6am EST tomorrow. We’ll put all new sign-ups in a numbered list and will use a number generator to pick 3 numbers. If you are already on the list but would like a chance at a key, leave a comment below and we’ll add you in too. Use the name you signed up with so we can find you in the list! I can’t wait! Cold has been so excited about this game for a while now and his enthusiasm is infectious! I’ll see you in the jungle soon maybe! Will you be the hunter or the hunted? Remember though – only for the PC version – I’d hate to get you excited then find out you only have an Xbox!